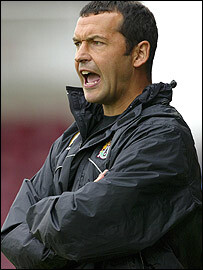 10 | February | 2008 | Through the seasons before us..
Smoulds feeling the pressure over the ‘protest’ that never was? You can tell a lot from a reaction, as football is by it’s very nature a cycle. When you follow a team for a while you get a whiff of how certain reactions can result in certain things playing out. I haven’t written much about the ‘protest’ that was planned for after the Millwall game, because it wasn’t particularly apparent what the protest was for! Clearly one of the protestors thought it a wonderful idea to pass the story on to The Mirror, who asked Smoulderwood what he thought about it (so I guess they at least figured the protest was against the manager), and he came out with the classic line, almost verbatim, that Kinnear used back in the day when his job was on line. “I’m not worried about what a few fans using the internet who don’t come to games think”, he said. Very reminiscent of Kinnear’s “Internet morons” tirade which, after uttering, within days he found himself unemployed, and I believe he is still without a job in football to this day! What worries me about this is, being an almost stalker-like reader of some of the Forest forums that I can access without requiring a login, my summary of those fans who are the least supportive of Smoulders are the fans who go to MOST of the games. After all, it is away from the City Ground that we find ourselves – whilst not exactly good – not exactly a shambles either. So if the manager seriously thinks the dissenting voices against him, given that Mark Arthur has also piled on a bit of pressure to, are solely remote supporters united only by an internet connection and an inability to get to the games, then he’s sorely sorely mistaken. Three points against Millwall certainly helps matters, but the quality of performance means the result merely papers over the tactical cracks – as we prepare for our biggest away game of the season at Leeds. They are on a poor run of results, their confidence is low, and yet – because we are SO bad away from home, none of us feel confident we can capitalise. So be careful Smoulds, you need to choose your words much more cautiously. I remember being surprised when we acquired Smoulds that Northampton fans seemed happy to have lost him, even though he’d delivered promotion – I can kind of see where they’re coming from now. Their mocking chants of “we’re not boring any more!” speaks volumes.